I love eggplant, and am always looking for fresh ways to cook with it. 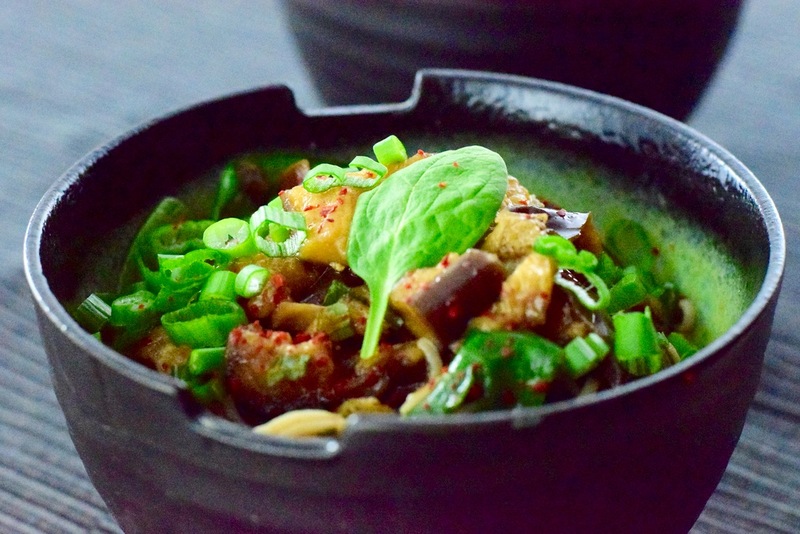 Steaming the eggplant turns it into a soft and silky sponge ready to soak up a flavorful Asian-inspired marinade. This recipe is inspired by one from the New York Times for a cold summer salad, but since it’s winter where I am, I’ve adapted it to be a lovely topping for nutty, hearty buckwheat soba noodles instead, which can be enjoyed warm, room temperature, or cold, and I’ve added baby spinach to the overall dish instead of serving it atop greens. But if you like, you can go with the original recipe’s plan of serving it over baby arugula, or perhaps over zoodles (zucchini noodles made with a spiralizer) if that’s your thing. How’s that for versatility? You’ll need a fairly large steamer for this, since you’ll be doing three medium-sized eggplants sliced in half. I have been enjoying the use of an inexpensive electric steamer by Hamilton Beach, which appears to no longer be available, but you can easily find a similar 5-quart electric steamer, like this one from Aroma. If you plan to steam a lot, it is very helpful to be able to turn it on, wander away and do other things, and not have to watch a pot. But if you’re using the plain old basket-in-pot method to steam, that works too! Just use a big pot or work in batches. Also note that the eggplant needs to marinate for about an hour, while you kick back and relax, and then all you need to do is make the noodles to finish the dish. Equipment: Large (5-quart) electric steamer, or equivalent large pot with lid and steamer basket, medium bowl, pasta cooking pot for soba noodles. Steam the eggplant: Prepare your steamer or pot by adding water, then placing the halved eggplant cut side down in the steamer basket (making sure it doesn't touch the water). If using a pot, you'll bring it to a boil over high heat and then turn to low for steaming (covered with a lid), and if you're using an electric steamer, you'll cover it, turn it on and set the timer according to the appliance instructions. Steam for about 20-25 minutes, until the eggplant is quite soft. Once done, set aside to cool. Make the marinade: In a medium bowl, whisk together the soy sauce, seasoned rice vinegar, lime juice, sesame oil, canola or grapeseed oil, pressed garlic, grated fresh ginger (optional), and ground cayenne or Korean red pepper flakes (optional). Taste and add salt if needed. Once the eggplant is cool enough to touch, cut into ¾" slices, and stir into the marinade. Let rest for 1 hour. Make the soba noodles: Bring a large pot of salted water to a boil, add the soba noodles, and cook according to package directions (usually 4-8 minutes). Drain, add the eggplant with marinade, plus the baby spinach, and toss well (the residual heat will wilt the baby spinach). Garnish with sliced green onions. Enjoy!